Try our Non-Alcoholic Grasshopper Pie Recipe, a tasty take on the classic mint cocktail. Our Non-Alcoholic Grasshopper Pie Recipe is perfect for parties. Beat pudding mix and milk in large bowl with whisk 2 min. Stir in 1-1/2 cups COOL WHIP and chopped cookies. Spoon into crust. Cover with remaining COOL WHIP; drizzle with melted chocolate. Prepare with 1 pkg. (1 oz.) JELL-O Pistachio Flavor Sugar Free Fat Free Instant Pudding, fat-free milk and COOL WHIP LITE Whipped Topping. For stronger mint flavor, add 1/4 tsp. peppermint extract to pudding mix along with the milk. Dip fork into melted chocolate, then let chocolate drip off fork tines as you move fork back and forth across top of pie. 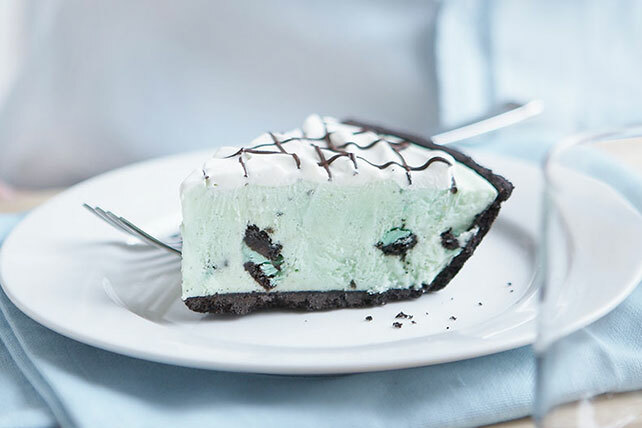 The chocolate and mint team up to make a terrific flavor combination, but if you prefer, prepare using regular OREO Cookies. Prepare as directed except freeze pie until frozen instead of refrigerating until firm. Remove pie from freezer about 10 min. before serving to soften slightly.